Whilst in Worcester on Sues Birthday Yesterday experimenting with her new Camera, she was able to get this great shot. 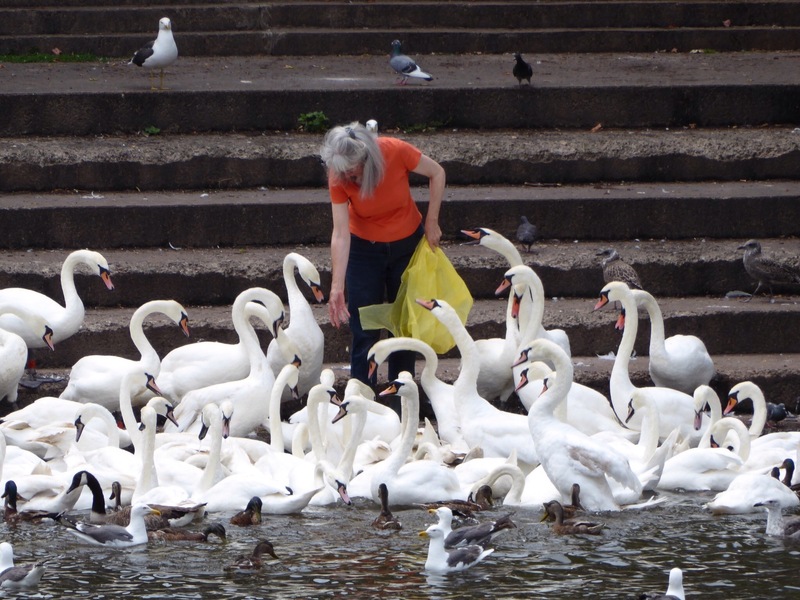 Decide who you want to attract, clearly the intent in this instance was to feed the swans but in doing so also attracted ducks, pigeons, and seagulls so when being social don’t forget the incidental followers who turn up just because they are interested in your content. We are all motivated by different content, in this instance it is bread, so give your audience what they want, however if this lady after freeding the swans bread for 5 days, turned up with a bag of cake on a Saturday in a yellow bag, the followers would still flock for the content due to brand accociation, in this example a yellow carrier bag. So don’t be afraid to introduce your audience to different content, they will still come back to your table as they remember the good experiences of their previous visits. Be kind, we all lead busy lives but what this photo tells us is a single act of kindness can go a long way, what you can not see from the photograph is how many people on the opposite bank of the river, stopped in their tracks and took time out of their busy schedules to enjoy this act of kindness. So when people follow you follow back, like their content and share it , retweet their content that way you can both grow and widen opportunity at the same time. Finally keep going I have no idea who the lady in the photograph is, but I whole hazard a guess that she will be there tomorrow and so will her followers. So when you find something that works for you keep going and just like the swans keep coming back so will all the others! Good Luck…. If you liked this content please like and share, if you live in Worcester and know this lady let her know about this article, I would like her act of kindness to go full circle.